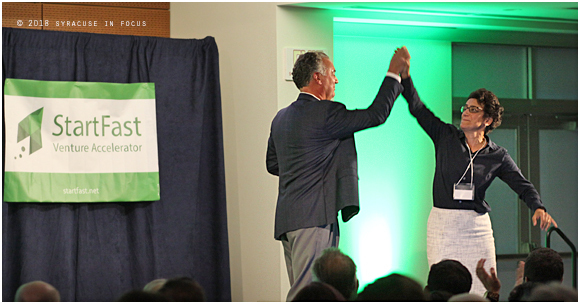 Le Moyne President Linda Le Mura (right) and Madden School of Business Dean Jim Joseph high-fived their way through the opening remarks of the 2018 Demo Day at Le Moyne College today. Fitness guru/Financial coach Walt Walker, on the set of his show Walt Wednesdays (at Lincoln Park). Trainer and Coach Walt Walker kicked off the The LikeMinded Experience at The Event Center on Saturday. 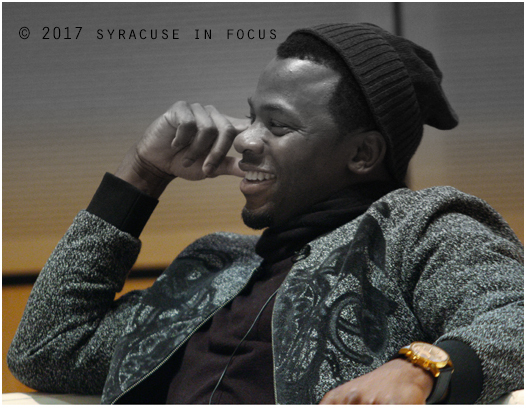 Actor Derek Luke visited Syracuse University recently for the Kappa Alpha Psi Executive Series and talked about capturing his voice (as a performer). He also discussed the clarity of choices actors, and even business people face with each pending project. Luke will soon generate a story about Dr. Chris Emdin, aka The Science Genius. Below he talks about how actors, like entrepreneurs, do best when they think outside the box. Carl Schramm,economist, author, professor and founder of Global Entrepreneurship Week, gave a lunchtime talk at Bird Library on Monday. More start-ups equals more jobs, and at their best entrepreneurs are synthesizers, he said. 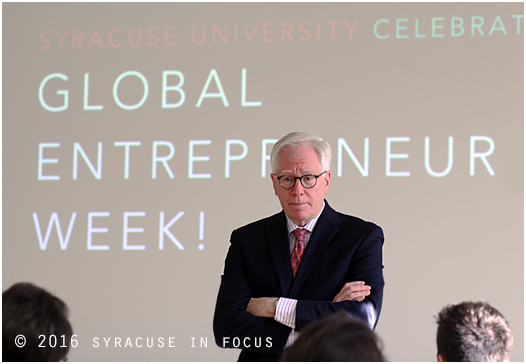 The Syracuse-native and former head of the Kauffman Foundation started Global Entrepreneur Week back in 2007. As part of his remarks on Monday, he also talked about our legacy of innovation here in the Salt City. Syracuse , now known for eds and meds, was once fertile ground for start up enterprises. In the days of the Erie Canal, he said, New York State was like Silicon Valley. Together pioneering ventures such as Sanderson Bros. Steel and LC Smith Typewriters helped solidify our region’s national reputation back in the day. One business leader in the audience hinted that manufacturing may be poised for a healthy resurgence in these parts. 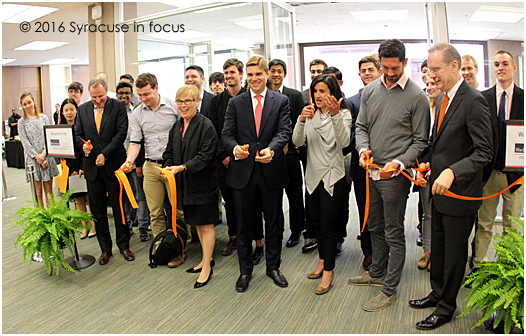 The ideas and dialogue from the Global Entrepreneurship Week at Syracuse University continues thru Nov. 18. Dignitaries including Chancellor Kent Syverud (far right) attended a launch celebration and ribbon cutting for the Blackstone Launchpad yesterday. 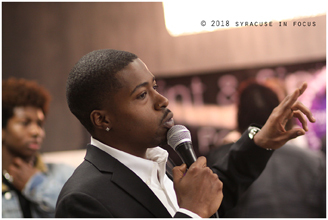 Blackstone LaunchPad is co-funded by the Blackstone Charitable Foundation and Syracuse University and will provide entrepreneurship support for faculty, staff and students. The start-up space is located on the first floor of Bird Library. The venture will directed by Linda Dickerson Hartsock, who has previous experience expanding the Tech Garden and the Connective Corridor. 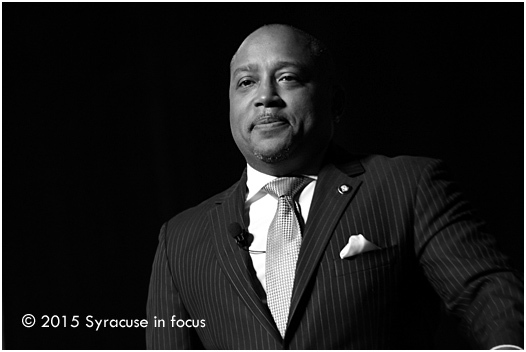 Daymond John, author, television star, fashion entrepreneur and business consultant , was the keynote speaker at this year’s Brazzlebox Summit. 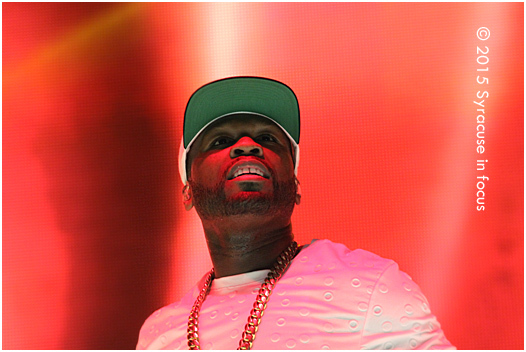 Musician/entrepreneur 50 Cent played the Carrier Dome with G-Unit on Friday night. We heard he also made an appearance to sign bottles of his vodka brand at a North side liquor outlet on Saturday. 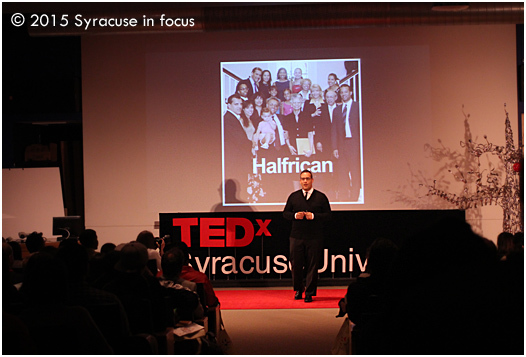 Another of our favorites from the TEDx event was Doug Melville, who talked about using diversity as personal currency. We named these posts positivity because Arel Moodie seems like the kind of guy who is always in a good mood. His enthusiasm is contagious. 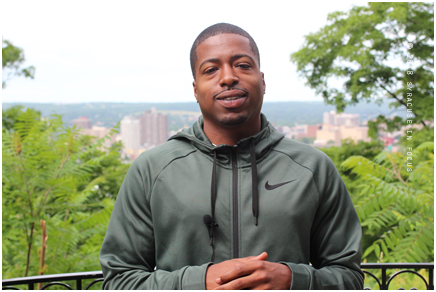 In this segment, listen closely for his likeability score for the city of Syracuse.